I finally received the parts that I had ordered, some was on back order and slow delivery. 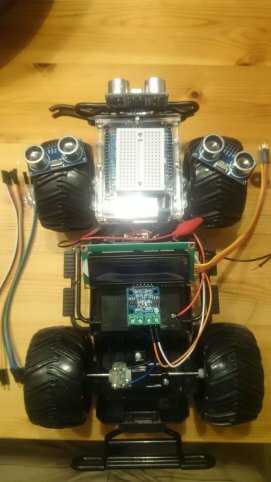 Some plans have also changed, Brum wont have bluetooth communication right now and instead use a 16x2 LCD display for relaying what is going on in the program. Might use the bluetooth in the future. The next step was to hook up the motor drive board and test run the engines to see if and how it works. For this I put together a small test code from code I found when googleing (can't find the source now but let me know if it's your code and I will update with links and credit!). The chip on the driver board is HG7881 turned out to be not that common so propper info was some what hard to find. The most important thing to remember is to run it of an external power source and when switching direction on the engines the speed value(goes from 0 - 255) is reversed! (So 0 = 255 and 255 = 0). The code below is without the LCD but files with and without the LCD code can be found at the end. A demo-video of the code running can be found after the code. Next step is to hook up one sensor and load the code, stay tuned!